Jazz funeral for Dinerral Shavers, Fifth African Baptist Church, January 6, 2007 – photo © Matt Sakakeeny. New Orleans is a city of parades, most famously the Mardi Gras processions that roll down the wide boulevards of St. Charles Avenue and Canal Street during Carnival season, but in all the seasons and in every neighborhood there are jazz funerals and parades known as second lines that fill the backstreets with a joyful noise. On Sunday afternoons from September through May, black styles of music, dance, and dress are put on display in parades that have become symbolic of New Orleans and its association with festivity and pleasure. The upbeat tone of second line parades originates in the distinctive local tradition of jazz funerals. In the traditional jazz funeral, a prominent member of the community—often a musician and nearly always a black male—is “buried with music.” Benevolent and burial societies traditionally arrange these funerals, often offering the services of a brass band for an extra fee. The societies collect dues throughout the year to pay for members’ health care and burial costs. The musicians, funeral directors, family, and friends of the dead make up what is called the first or main line, while the crowd marching behind is collectively known as the second line. As the procession moves from the funeral service to the burial site, the first and second lines march to the beat of a brass band. At the beginning, the band plays dirges, somber Christian hymns performed at a slow walking tempo. After the body is laid to rest, or “cut loose,” the band starts playing up-tempo music, the second liners begin dancing, and the funeral transforms into a street celebration. This website features descriptions of jazz funerals described in the book, including a traditional funeral for Harold Dejan and a contemporary funeral for Shorty Chancley. This website features a description of a traditional second line parade sponsored by Black Men of Labor. This website features descriptions of contemporary second line parades sponsored by Treme Sidewalk Steppers, Lady Buckjumpers, and Prince of Wales. 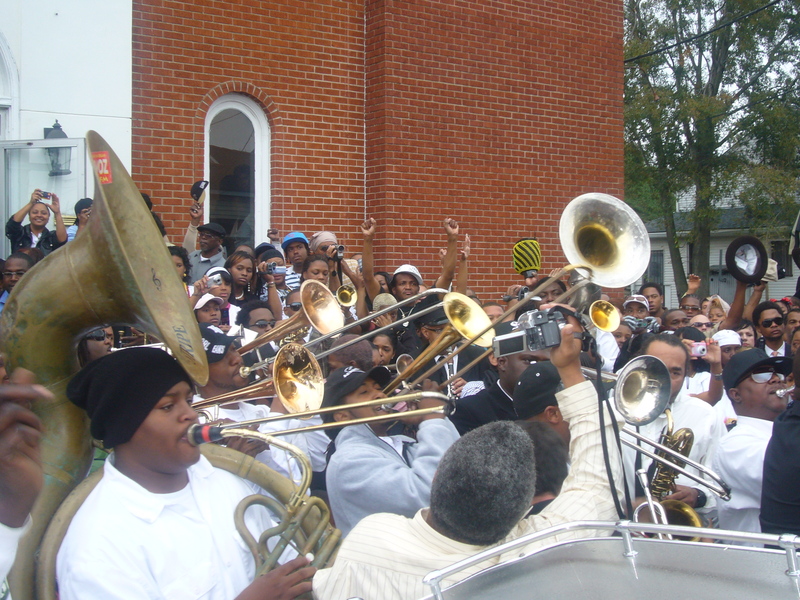 Watch members of the Young Men’s Olympia Social Aid & Pleasure Club dance with second liners with the Rebirth Brass Band, October 2010.